Yesterday we talked about the Orgullosa Community, and that leads into my not so Wordless Wednesday today. In one of the facebook groups I belong to, one of the bloggers posted a call for New Yorkers who wanted to try out a new salon to let her know. With the year and a half I just went through, while I didn't make formal 'New Year's Resolutions', one of the things I promised myself this year is that I would not just embrace, but actually make change in my life. I know that this year won't be different if I approach it the same way, and do the same things. I want 2013 to be a whole new year, one where I strive to balance taking more time for myself and still meeting the demands of an ever-changing constantly on the go schedule. Spending so much time last year in the hospital made my hair change a bit because of everything I went through including the crazy meds. So honestly when this opportunity opened up it was a total no brainer for me. And so I decided when I agreed to take it that I would truly let the salon go nuts and make my hair over totally. Although true to my nature I did do my research! Mark boasts quite a roster of celeb clientele (I won't name drop here, but you can check out his site www.markonmadison.com for a list). Mark has worked with publications such as Sports Illustrated and Vanity Fair! He has also worked a wide variety of high profile events including The Academy Awards, New York Fashion Week and Good Morning America! I arrived with well below my shoulders curly hair! The first thing he told me was 'throw out your flat iron!' - As a life long wavy girl I wasn't sure at first how possible that would be for me as I normally prefer to wear my hair straight. Mark created long side parted fringe layers instead of bangs! He also blew out my hair in what has to be an Olympic Record Speed, and showed me how to section my hair for not only faster results, but also less breakage! Mark took the time to understand what my real day-to-day is like and gave me his signature cut which not only frames my face, but he also took the time to teach me step by step how to maintain it, so when I left the salon I could keep the same style up at home with less effort than before. He also gave me product recommendations and helped de-bunked one of my product myths. I often avoided products that were labelled for 'curly' hair since I tend to wear my straight, but the for curly products he used on my hair worked well for me, and made me re-consider what I have been using at home. And when I told him that I love my waves, I just hate the frizz, he gave me ideas to help achieve 'Beachy Waves' but avoid the frizz. He told after washing my hair to try gathering it like making a ponytail, then twist it clockwise and put it in a bun and sleep with it (works best for me with hair towel-dried because I have thin, fine hair that is very frizz prone) and then wake up and just rake the waves with my fingers, and then blow dry the front if I wanted it to be sleeker in the front or on top. I love that idea because it's actually workable for me since I have very little time in the morning. Thankfully I'm already using the right brushes (he recommended blow drying my hair with a boar bristle brush), which helps to make the process not only easier but also produce the desired results. Oddly enough I went in finally ready to commit to a bigger change, and he didn't really feel I needed it. I don't have grays yet, so he didn't really feel a one process color would be a good idea for my hair type. And because I told him I do take the time out to try and wear my hair straighter, he didn't want me to take off a lot of length. And if a great cut and styling, way faster than I even expected wasn't enough, we also went to a local coffee shop and talked 'shop' for awhile, you have to love a stylist who splits a cheesecake with you! If that's not down to earth I don't know what is! I highly recommend Mark! And I also love that I found him on a New York City Bloggers forum, I love when bloggers share great leads! I'm not sure I would have found this salon without the recommendation, so word of mouth definitely pays off! Ƹ̵̡Ӝ̵̨̄Ʒ - 'Like' Mark on Facebook too! When you visit the salon, be sure to tag both Ascending Butterfly and Mark on Madison on Facebook so we can check out your new 'do'. I don't have an official linky, but bloggers please feel free to comment on this post with a link to your Wordless Wednesday posts so we can check out your pictures too! 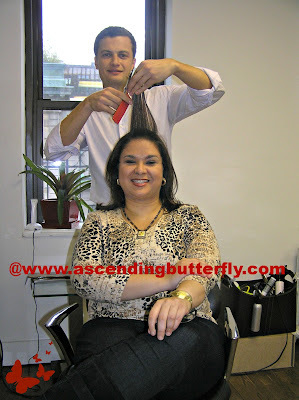 Happy Wordless Wednesday and Happy Hair Day Butterfly! FTC Disclosure: This is a non-compensated post, no monetary compensation has been received to share my salon experience. I was provided with styling services free of charge for editorial consideration, however as always, all opinions are 100% my own! I like the flow and bob if your new hair cut. I need to get a new cut also! @Onica MommyFactor - Thanks! I would highly recommend Mark! A new cut just helps you look at yourself differently! Change is a good thing! @Maria - I have one that I've had since I was 13, but it's under my hair! Even in a ponytail you can't really see it! It's funny, this time I was going to be bold and try out color, I've never put in a permanent hair color! I feel 30 pounds lighter, there is something about a new haircut that does that! 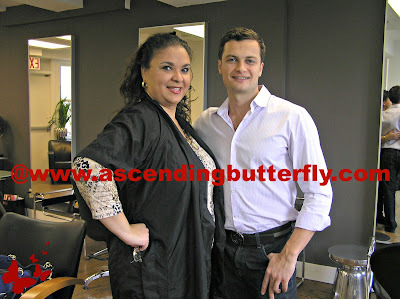 @Ghada @Mama goes Bam - Seriously, no one has ever blown out my hair that fast. A lot of hairdressers when they realize my hair is so thin, tend to think it's naturally easy or fast to dry it, but it usually takes them longer than they think, but he dried my hair so fast I was totally surprised. He had me watch how he sectioned it and the technique he used to get the roots dry and then the ends, he also didn't pull or tug my hair as much as I'm used to! And NO Flat Iron to achieve the look, color me impressed! Lovely. Nothing like a great stylist, kne less thing to worry about. I am back blogging FF friend, Im now at initialcharmer.com Great post. @CJ Thomas - Definitely, a great stylist is so hard to find! I'm glad you are back, I'm off to pay you a visit, Happy Wordless Wednesday! Great cut, you look really pretty!! New look new you ,a new cut always makes me feel like a new women. You look fab but you did look fab before also heheh!